Property Location With a stay at Comfort Inn And Suites Orem in Orem, you&apos;ll be convenient to Utah Valley University and McKay Events Center. 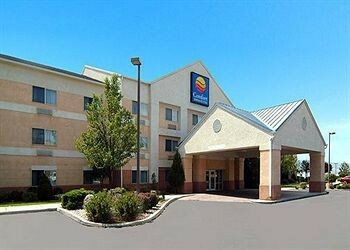 This hotel is within the vicinity of Utah Lake State Park and Lavell Edwards Stadium.Rooms Make yourself at home in one of the 77 air-conditioned guestrooms. Complimentary wireless Internet access keeps you connected, and satellite programming is available for your entertainment. Conveniences include desks and coffee/tea makers.Rec, Spa, Premium Amenities Enjoy a range of recreational amenities, including an indoor pool, a spa tub, and a fitness center. Additional amenities include complimentary wireless Internet access, a fireplace in the lobby, and a television in the lobby.Dining A complimentary buffet breakfast is included.Business, Other Amenities Featured amenities include a 24-hour business center, dry cleaning/laundry services, and a 24-hour front desk. Planning an event in Orem? This hotel has facilities measuring 1000 square feet (93 square meters), including meeting rooms. Free self parking is available onsite.